The current goal of therapy in treatment of FTD is symptomatic relief. While the medicines identified here may be useful in some individuals, other individuals may worsen with a medication. It’s worth checking with your MD to see what he or she thinks about these meds. I’ve found that meds work. I’ve heard many people say they don’t want to use meds, but my experience is that done in the proper way, they help a great deal. One of the more difficult things to deal with is telling someone with FTD that they can no longer drive. I was lucky. The MD who diagnosed my wife told me that she would be the one to tell her not to drive. She would be the bad guy. Whenever my wife said she wanted to drive, I would tell her that Dr. B said she shouldn’t and that we would ask at the next visit if it would be OK. My wife wasn’t happy and reluctantly accepted the fact that it was beyond my control. Plus she felt there was some hope that at the next visit things would change. As time passed, my wife stopped asking. Liability is a big issue. I hear caregivers say that their loved one only drives a mile to the local market. A lot can go wrong in a mile, in the driveway, in a parking lot. The Alzheimer’s Association has put together some guidance on how to deal with the driving issue. Each MD will have strengths and weaknesses, and various levels of understanding about FTD. Your relationship with them is as important as their professional credentials, so trust your assessment of whether or not you are receiving the appropriate care. Here is a list of medical doctors that you may encounter and suggestions for how to find the right one for your needs. Location: Arden Courts Memory Care, 45 South Rd, Farmington, CT. The CT FTD Foundation has a support group meeting for all caregiver’s and families/friends who have a loved one diagnosed with Frontotemporal Degeneration (FTD). The support group meetings are a chance for everyone to share their experiences and express concerns. It also gives a chance to share ideas that have worked for other caregivers going through the same experience. Meetings are informal. You are welcome to bring your loved one with FTD, Arden Courts will provide respite care in a separate room. Please just let us know in advance if your loved one will attend. 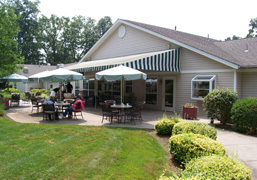 Meetings are the third Sunday of every month at Arden Courts Memory Care, 45 South Rd, Farmington, CT. Time: 1:00pm – 2:30pm. Hosted by the CT FTD Foundation, meetings are free. For more information contact info@ctftdfoundation.org. Raising money for FTD research and programs. The 4th Annual CT FTD Foundation Golf Tournament is on Friday, August 19, 2016, at Lyman Orchards Golf Club in Middlefield, CT.Contact – info@ctftdfoundation.org – with any questions. Funded by the State Department on Aging and is operated in partnership with the Alzheimer’s Association Chapters of Connecticut and the Connecticut Area Agencies on Aging. Eligible families may apply for daytime or overnight respite care services. The Alzheimer’s Association Respite Fund, subsidized from individual and corporate donations to the Association, is a financial reimbursement program designed to assist caregiving families in accessing respite care services.